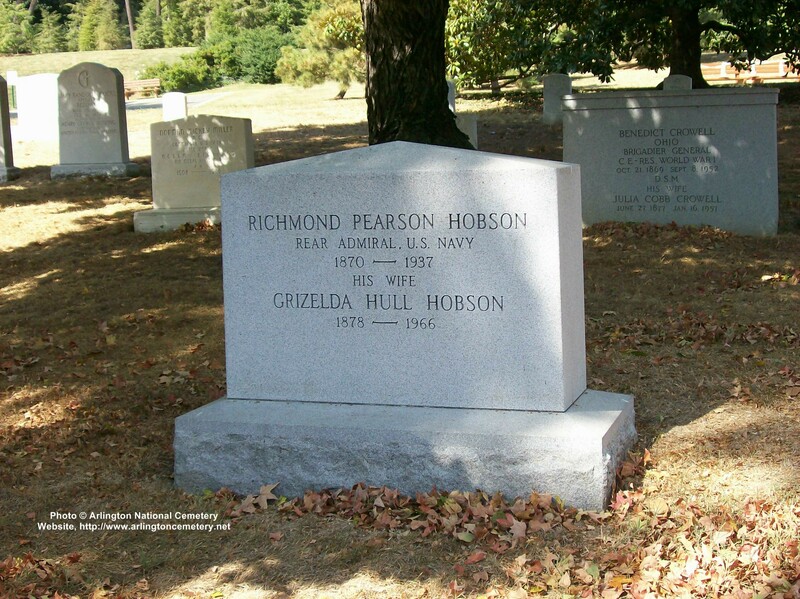 Richmond Pearson Hobson (17 August 1870-16 March 1937) was a United States Navy admiral who served from 1905-1915 as a Congressman from Alabama. A veteran of the Spanish-American War, he received the Medal of Honor years later for his part in that conflict. He was born in Greensboro, Alabama, and graduated from the Naval Academy in 1889. After duty in Chicago he underwent additional training and was appointed Assistant Naval Constructor in 1891. 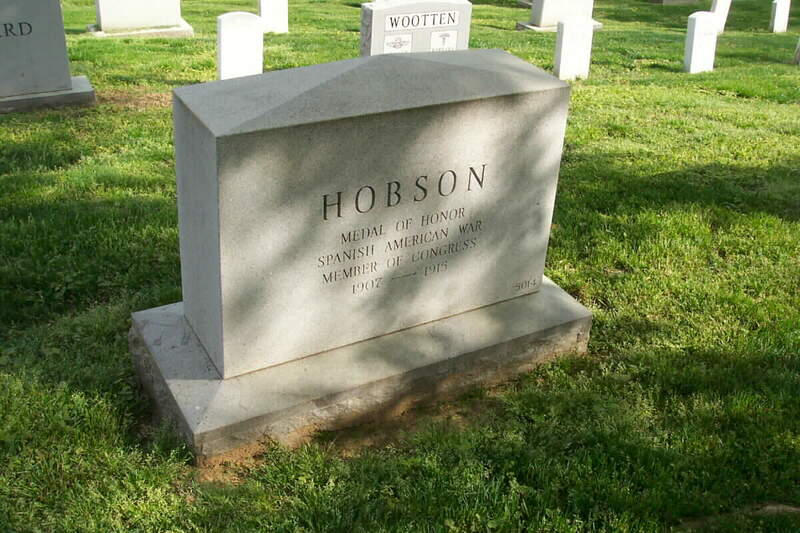 Hobson then served at various Navy Yards and facilities, including a tour of duty as instructor at the Naval Academy. In the early days of Spanish-American War, he was with Sampson in New York, and arrived off Santiago 1 June 1898. In order to bottle up Cervera's squadron Hobson took temporary command of collier Merrimac, which he would attempt to sink as an obstruction in the channel. The attempt was made early 3 June under heavy Spanish fire, which disabled the steering gear of the collier. Hobson did sink Merrimac, but was unable to place her in the shallowest part of the channel. With his intrepid crew of six, he was picked up by Admiral Cervera himself, and treated quite chivalrously for his gallant expedition. Hobson was advanced 10 numbers in grade after the war and later, in 1933, awarded the Medal of Honor for his heroic attempt to block the channel. After the Spanish-American War he worked on the repairing and refitting of captured Spanish cruisers at Cavite and at various shore stations of the Navy. One of his close friends was American genius and inventor Nikola Tesla. In later years, Hobson was the only person who was able to persuade Tesla to interrupt his intellectual pursuits for a movie gathering. 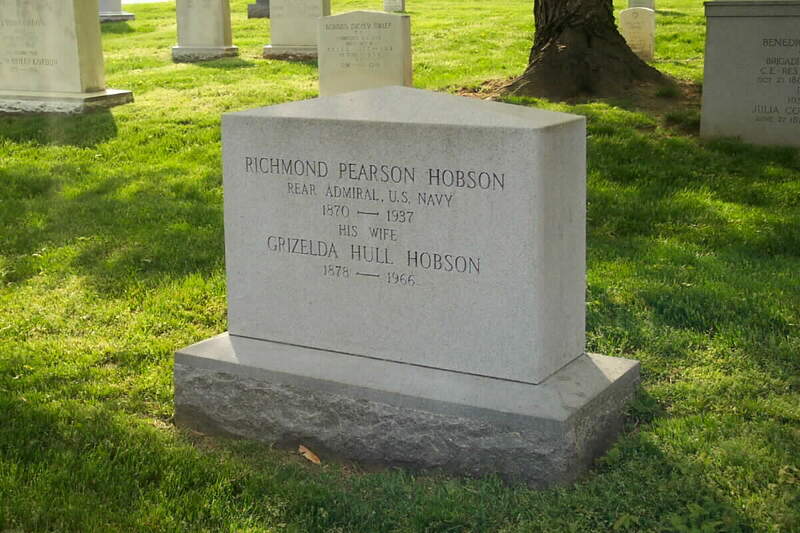 Hobson was the author of a book about the events surrounding the sinking of collier Merrimac in which he participated as the leader of a volunteer squad. 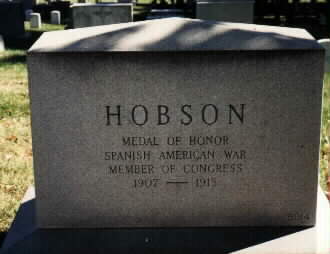 Resigning in 1903, Hobson remained a staunch supporter of the Navy and during his subsequent career as a Congressman from Alabama, 1905-1915, was a firm advocate of naval expansion. In 1934, by special act of Congress, he was advanced to Naval Constructor with a rank of Rear Admiral, and placed on the retired list. 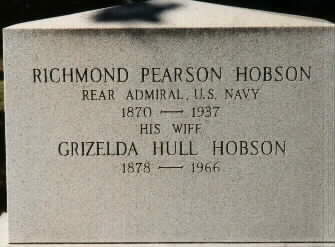 Rear Admiral Hobson died 16 March 1937 in New York City. The destroyer USS Hobson (DD-464) was named in his honor. 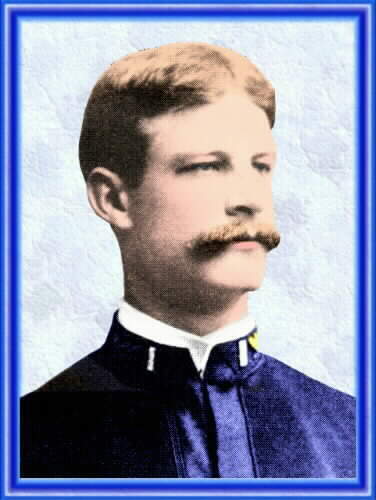 Born at Greensboro, Hale County, Alabama, August 17, 1870, he graduated from the United States Naval Academy in 1885. 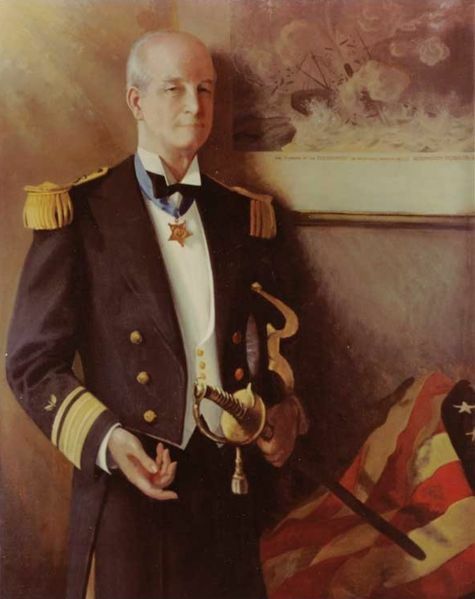 He was awarded the Medal of Honor in 1933 for sinking the collier Merrimac in Havana Harbor in 1898 during the Spanish-American War. He was made a Rear Admiral by an Act of Congress in 1934 and was the founder and president of Constitution Democracy Association in 1935. He also served briefly as a Member of Congress from Alabama. 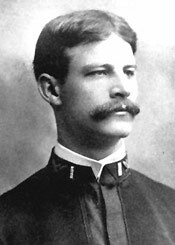 Representative from Alabama; born in Greensboro, Hale County, Alabama, August 17, 1870; attended private schools and Southern University; was graduated from the United States Naval Academy in 1889 and from the French National School of Naval Design at Paris in 1893; served in the United States Navy from 1885 until 1903; special representative of the Navy Department to the Buffalo Exposition in 1901 and to the Charleston Exposition in 1901 and 1902; naval architect, author, and lecturer; elected as a Democrat to the Sixtieth and to the three succeeding Congresses (March 4, 1907-March 3, 1915); unsuccessful candidate for nomination in 1916 to the Sixty-fifth Congress; moved to Los Angeles, Calif., and later to New York City; organized the American Alcohol Education Association in 1921 and served as general secretary; organized the International Narcotic Education Association in 1923 and served as president; organized the World Conference on Narcotic Education in 1926 and served as secretary general and as chairman of the board of governors; founder of the World Narcotic Defense Association in 1927, serving as president; awarded the Congressional Medal of Honor in 1933 for sinking the collier Merrimac in 1898; was made a rear admiral by act of Congress in 1934; founder and president of the Constitutional Democracy Association in 1935; died in New York City March 16, 1937; interment in Arlington National Cemetery. In connection with the sinking of the U.S.S. Merrimac at the entrance to the fortified harbor of Santiago de Cuba, 3 June 1898. Despite persistent fire from the enemy fleet and fortifications on shore, Lt. Hobson distinguished himself by extraordinary courage and carried out this operation at the risk of his own personal safety.